The Lakeland law firm of Goldman, Babboni Fernandez & Walsh is the result of a partnership between four of Southwest Florida's most highly respected attorneys, M. David Shapiro, David Goldman, Michael Babboni and Bernard F. Walsh. At our personal injury and wrongful death law firm, they and our four additional attorneys proudly represents clients from Polk County who have suffered injuries or losses in motor vehicle and workplace accidents and as the result of other acts of negligence. Under Florida law, victims of negligence and the families of fatally injured victims have the right to pursue compensation for the losses associated with those injuries. The legal team at Shapiro, Goldman, Babboni & Walsh has extensive experience with all types of personal injury and wrongful death cases. 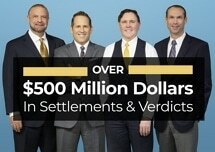 In fact, our attorneys have recovered compensation for clients in more than 10,000 cases. Whether it was you or someone you love who sustained injuries in an accident, our attorneys will fight for the compensation you need to ensure you or your loved one's financial needs are met. In addition, we will work to ensure the protection of your rights throughout the legal process. You can take advantage of our offer for a free initial consultation at our Lakeland law office if you would like to find out whether you are eligible to file a personal injury or wrongful death claim.